My mom has made Sun Tea my whole life. It was rare that I didn’t see the jar of tea sitting on the edge of the porch. My dad goes through it like my car goes through gasoline……except it’s cheaper. Wish my car could run on Sun Tea. Barry likes tea too, so when we got married I started making it for him. Him. I hate tea. It makes me wanna yak. However, I have decided that I am going to attempt to learn to love it. I know it’s good for me……I just have to keep repeating that to myself. IT’S GOOD FOR ME! So are sardines, but that hasn’t really done much for me. 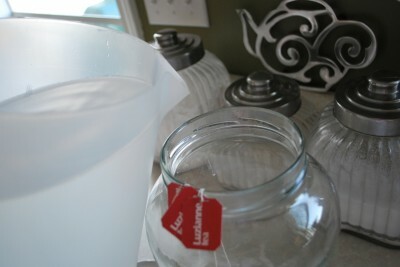 All you need is water, tea bags, and a glass jar. Mom gave me this glass jar. I think it used to house pickles. If your jar used to house pickles, make sure you air it out and get rid of the pickle smell before you make tea…..that wouldn’t be a nice surprise for your husband – unless you’re mad at him. 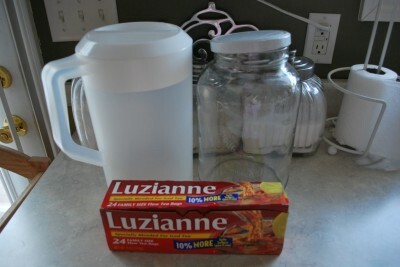 It’s pretty easy to find a glass jar like this….just ask around. Or visit Sam’s and buy something just for the jar. Been there, done that. Have I ever mentioned I have this thing for glass jars? It takes 3 family sized tea bags to make 1 gallon of tea. I know my jar is exactly 1 gallon and I know my pitcher is exactly 1 gallon. Makes easy measuring for me! If you don’t have that same option, then just do the math. I would do it for you, but I hate math. That’s why I married my math genius husband……and it’s also why I bought a good calculator. 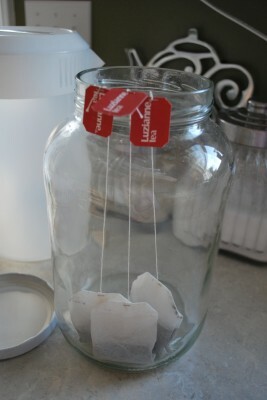 Keep the paper part of the tea bag on the outside of the jar. Pour water over the tea bags. You could just pour the water straight into the jar, but I used the pitcher……because for some reason I like to make things more difficult. Nah, actually it was because it took a better picture. If you weren’t watching, I wouldn’t have done this. You can use hot, warm, or cold water……no matter. Now, put the lid on. Yes, do it. You’re going to sit this thing outside, so trust me you need a lid. Various objects could make it into that jar……flies…….bees……bird doo-doo. Yep. A lid is a good idea. Unless you’re mad at your husband. Set it outside in the sun. Yes, I realize that mine is not in the sun. I did it in the early morning while things were quiet. Nah, it’s not quiet around here – I just do it when I remember. The sun will eventually make its way there. My apologies for the tomato plant that made its way into this picture…..it needs to be planted in the Topsy-Turvy pot (please pray for my tomato plant – last year’s plant died a horrible death). Note: after I wrote this post, hail beat my Topsy Turvy to bits……it was shredded like cheese. So, now our tomato plant resides in a pot, but it still needs your prayers. Ta da! It’s done! How long you leave it outside will vary on the sun and how hot it is. This sat out for 4 hours. You’ll be able to tell when it’s done – it will just look……..well, done. I bet you totally didn’t see this coming, did you? I think it’s pretty doggone amazing. I love being able to harness the power of the sun for various things like laundry and diapers. Wash your hands (unless you’re mad at your husband) and squeeze the water out of the tea bags. You want to get every last bit of goodness out of there. If you have a compost pile, you can put the grounds there……I don’t have one (yet). 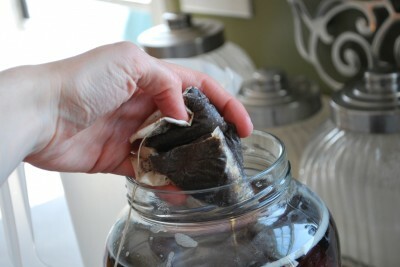 Or you can use the tea bags again to make a pot of “decaf” tea. Pour the tea down into your serving pitcher. Now is when you add the sugar. Barry likes his tea plain, so I skip this part. 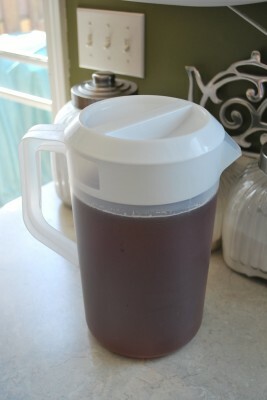 Yes, we are from the south and yes my husband likes unsweet tea. It’s weird, I know. There ya go! Stick it in the fridge for a nice, cool treat in the hot summer. It’s very easy to make. Thank you Sun! Since I had a reader contact me about it, I do need to add there is a small bacterial risk with making your tea this way, or any way that doesn’t actually boil the tea. This is an extremely minimal risk, but I want to make sure you’re in the know. Thanks, Amanda! 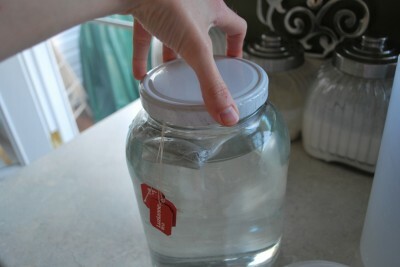 Place tea bags and water in a glass jar. Let sit in sun until brewed (3-4 hours). 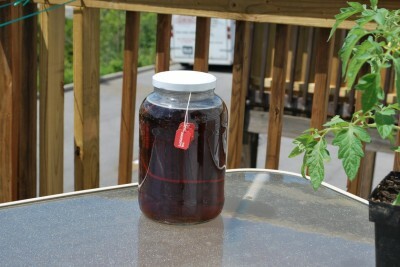 Sun tea requires proper preparation. Cleanliness of the container should be considered. And don’t forget to put it on the refrigerator! 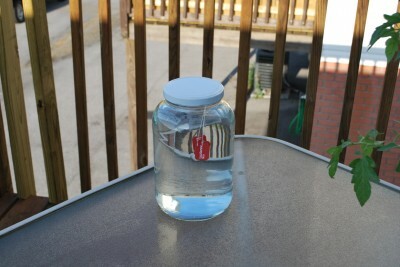 Sun tea being simply left in the bright sun to steep can possibly harbor bacteria. Thanks Deana! That’s exactly why I included the link in the post about how to do it properly. 🙂 We feel very safe doing it and no one in our family has ever gotten sick. So I want to make this but that bacteria article scared me. Your thoughts on it??? 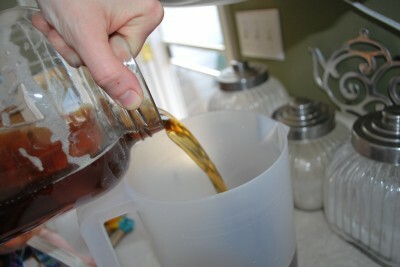 My mom has made sun tea for 30 years…..and her mom before her. 🙂 And I still make it. The chances of getting sick from picking up a bag of lettuce at the store are higher. Just make sure you wash the container each time in hot soapy water and don’t let it steep more than 4 hours. I remember your momma making this when we were kids.